I’m writing this blog post in hopes of convincing you to see every microbial cell as a unique individual. It’s a big ask, because microbes are numerous, and even card-carrying microbe lovers have a tendency to think of them as populations rather than as single cells. I’ve been guilty of the same thing; it’s only since I started working as a postdoc in the Marx Lab at UI that I’ve started to appreciate microbial individuality. And doing so has also forced me out of my comfort zone and into using tools to study microbes in unusual ways—an experience that I’m thrilled to share with you. Much of microbiology has been built on the assumption that if two bacterial cells have the same genes and live in the same environment, they’ll behave in the same way. This assumption stems partly from necessity: it’s hard to study a single cell, so for most of the history of bacteriology, we’ve studied microbes by growing billions of genetically identical (“clonal”) cells in flasks and quantifying their bulk properties– for instance, measuring how fast the mass of the population doubles, rather than watching individual cells divide. We’ve long known that this is an oversimplification, but it’s a very effective oversimplification, one that has often allowed us to make predictions with stunning accuracy. Except… sometimes even a clonal population of bacteria contains some cells insist on doing their own thing. One well-known example of such “phenotypic heterogeneity” is microbial persistence in the face of antibiotic-induced death. When a sensitive population of bacteria is treated with bacteriocidal antibiotics, most of them die at a rate that is so predictable it can be used to model precisely how much drug and how much exposure time are necessary to eliminate the population. But amid all the antibiotic carnage, we often find a small minority of cells that, nevertheless, persist. The researchers who first examined this phenomenon by observing individual cells in action found that persister-type cells die slowly because they were previously growing slowly: they just happen to be a minority sub-population that hasn’t been actively reproducing. In general, that’s not a great strategy for a bacterium, because the whole point of being a bacterium is to make more bacteria. But it does turn out to be a good strategy if a pulse of antibiotics suddenly shows up, because antibiotics are more harmful to growing cells, so non-growing cells are able to withstand exposure longer. The most remarkable thing is that persistence is, ironically, transient—a cell can pop in and out of the persistent state, and doesn’t give its offspring any special ability to withstand antibiotics. (This makes it fundamentally different from the genetic antibiotic resistance that is a growing problem in hospitals today.) We even have evidence that this phenotypic diversity can be a useful evolutionary strategy, allowing the microbial population to “hedge its bets” by keeping a few non-growing cells on hand even while most are reproducing normally, ensuring that there will be a some survivalists ready to hunker down and wait it out a pulse of antibiotics should strike. What does all of this have to do with my own research? Phenotypic heterogeneity seems to play a role in the way bacteria deal with a variety of different stresses, and in the Marx Lab, we study a very specific stressor: formaldehyde. Our model organism, Methylobacterium extorquens, is able to eat methanol, but when it does it produces formaldehyde as a metabolic intermediate. And somehow it manages the constant presence of that toxin quite well. We’ve recently observed some examples of phenotypic heterogeneity in M. extorquens populations, both when dealing with formaldehyde in its environment and when simply initiating methanol growth, and we’re curious to find out whether heterogeneity might be a survival strategy, or at least provide a clue about the mechanisms that M. extorquens uses to manage formaldehyde stress. Colony growth trajectories. Each line represents an individual bacterial colony and its increase in size over time. 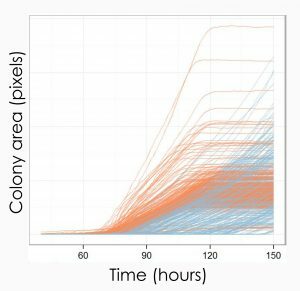 Red lines and blue lines are two different genotypes; even within the blue genotype, there is marked variability in the amount of time it takes a colony to start growing (less so in the red genotype). There are a few ways to observe differences among individual bacterial cells, many of them involving very fancy equipment, but one of my favorite methods is one of the simplest: looking at bacterial colonies on petri dishes. Of course, a colony is a dense mass of millions of cells, but each colony began as a single cell, so if you watch a lot of colonies, you can learn something about the variation in the single cells that started those colonies. For instance, we’ve found that if we stress cells with formaldehyde and then plate them out onto a formaldehyde-free petri dish to recover, some pop up right away and others take a long time to start growing. 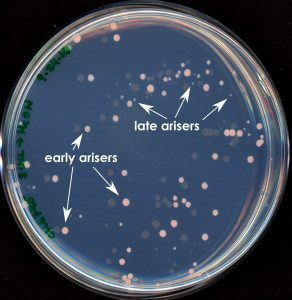 The distribution of colony arisal times may therefore give us some information about the growth state of the bacteria when they were stressed, or the nature of the cellular damage from the formaldehyde. Timecourse of images of colonies developing on a culture plate over several days. What’s more, you can observe an awful lot of colonies as they grow if you place your petri dishes on a flatbed photo scanner and scan them every hour! For real—I’m talking about the kind of scanner you can buy at your local office supply store. I’ve fallen in love with this method not only because it generates really cool data, but also because building it has been uncommonly fun. There doesn’t yet exist a company (that I’m aware of) that sells petri-dish scanners, though there are other labs who have built these systems and happily offer guidance. 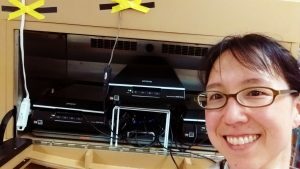 I’m a biologist who started in on this project all geared up for pipetting and plating and culturing, certainly not expecting that I’d find myself setting up a custom scanner array—routing cables galore through our lab ceiling, troubleshooting power supply issues, calibrating temperature probes, and writing code for image analysis. It has been a fantastic growing experience not only for my bacteria but for me as well. I’ve also been amazed at the enthusiasm and generosity of friends and strangers—biologists and non—who have offered their help. I’m hoping that this project will not only further our understanding of microbial biology in a new direction, but continue pushing me in a new direction too. Stressed-out bacteria form colonies at different times; the ones that recover fastest end up being the biggest. Balaban, N.Q., Merrin, J., Chait, R., Kowalik, L., and Leibler, S. (2004). Bacterial persistence as a phenotypic switch. Science 305, 1622–1625. Ackermann, M. (2015). A functional perspective on phenotypic heterogeneity in microorganisms. Nat Rev Micro 13, 497–508. Levin-Reisman, I., Fridman, O., and Balaban, N.Q. (2014). ScanLag: High-throughput Quantification of Colony Growth and Lag Time. J Vis Exp. This entry was posted in BEACON Researchers at Work and tagged antibiotic resistance, bacteria, BEACON Researchers at Work. Bookmark the permalink.